My latest article on RedGate’s SimpleTalk site has just come out: Mobile Report Publisher – Dashboards Everywhere. In it, I give a quick overview of using SQL Server 2016’s Mobile Report Publisher to create a simple but useful dashboard. Mobile Report dashboards can be assembled easily, and quickly, from SSRS (SQL Server Reporting Services) Shared Datasets. Reports generated with Mobile Report Publisher are great, as they can be used on, as the name suggests, mobile devices such as phones and tablets, but on websites as well. They fill the need between a traditional report and those analytic reports created by self service tools such PowerBI. Using the instructions in my SimpleTalk article, you should be able to create your first, simple report. If that wets your appetite for more, I can offer two additional learning paths. First, there’s my book SQL Server 2016 Report Services Cookbook. In it I have an entire chapter on the Mobile Report Publisher. Being an entire chapter I had more space to go deeper, and provide instructions on pulling data from multiple sources. I also go into the use of other components in the dashboard. You can find the book on both Amazon and my publisher, PactPub’s website. The second resource is my Pluralsight course What’s New in SQL Server 2016 Reporting Services. The report gives a great overview of all the new features of SSRS 2016 (and still applicable to 2017). The bulk of the course focuses on the Mobile Report Publisher, but I also cover other new features such as the new Report Portal, and the ability to host KPIs right on the portal, among other features. Don’t have a Pluralsight subscription? No worries, just email me, free@arcanetc.com and I can send you a code good for 30 days during which you can watch my courses, or any of the great courses at Pluralsight! SQL Server 2016 Reporting Services Cookbook–On Sale Until 2018! Happy Holidays! As a gift to everyone, PACKT Publishing has put the e-book version of my SQL Server 2016 Reporting Services Cookbook on sale for just $5. Yes, that’s right, for the same price as a pumpkin spice chai tea latte with extra whip cream, and a quick trip to http://bit.ly/ssrscook, you could be reading this magnificent tome of wisdom. Now, I can year some of you going “but Robert, SQL Server 2017 is out now, is this still relevant?” Yes, absolutely! Very few changes were made to the 2017 version of SSRS, so everything in this book is just as valid. And it’s not just my book that is on sale, all the e-books at PACKT are on sale for the same low low price. 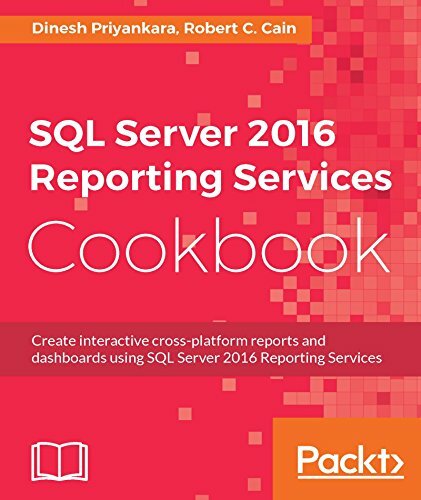 So after you get done adding the SQL Server 2016 Reporting Services Cookbook to your shopping cart, be sure to check out the other awesome titles on PACKT Publishing. This book, by the way, makes an excellent companion to two of my Pluralsight courses. The SQL Server Reporting Services Playbook, https://www.pluralsight.com/courses/sql-server-reporting-playbook, is designed for people who are totally new to SSRS and need to get up to speed FAST. Already know SSRS, and just want to learn what’s new with SSRS 2016? Then my appropriately named What’s New in SQL Server 2016 Reporting Services course, https://www.pluralsight.com/courses/sql-server-2016-reporting-services, is just the thing for you. It goes over just the new features in SSRS 2016 (and still applicable to 2017) and does it fast. With this short course you can be up and running with 2016/2017. and I can fix you up with a code good for 30 days during which you can watch my courses, or any of the fine courses at Pluralsight. (If you want to see all my courses, just click the About Me link at the top, or go to http://arcanecode.me). If you have some free time during the holiday season, and want to avoid the in-laws, then curling up with a great book (like the SQL Server 2016 Reporting Services Cookbook) beside the yuletide fire can be a great way to spend your time! SQL Server Reporting Services Playbook now live on Pluralsight! My newest course, the SQL Server Reporting Services Playbook, is now live on Pluralsight! If you are looking to get up to speed fast writing reports in SQL Server Reporting Services, this is the course for you. In roughly two hours you will have enough information to start cranking out reports for your organization. Playbooks though are a bit different than traditional Pluralsight courses. Playbooks are specifically designed so you can watch just one segment to gather that piece of information you need right now, and not have to sit through the entire course. For example, if you were comfortable with generating line item reports, but need a refresher on how to use charts in a report, you could watch just the 15 minute module on charts. The playbook format is also great for times when, after watching a course, you need to come back and refresh yourself on one piece. The organization makes it easy to find the specific piece of information you need. After watching this course, you may wish to go watch my previous course, What’s New in SQL Server 2016 Reporting Services. ( https://www.pluralsight.com/courses/sql-server-2016-reporting-services ). This course is another brief one which assumes you are comfortable with Reporting Services and want to get up to speed quickly on the new features in 2016. I for one really appreciate this style of course, as it doesn’t waste time teaching me what I already know about SSRS, and instead just focuses on the things that have changed since the previous version. And let me assure you, a lot has changed in SSRS 2016! What’s that you say? You don’t have a Pluralsight subscription but really want to view this course? Well no problem my friend, just email me <free at arcanetc.com> and I’ll be more than happy to send you a code that will give you 30 days free at Pluralsight to watch mine or anyone’s courses. By the way, this is my 13th Pluralsight course, you’ll find the whole list at https://www.pluralsight.com/authors/robert-cain . My courses cover a variety of topics, Reporting Services of course, but also PowerShell, SQL Server Integration Services, and a nifty course introducing you to the concepts of Data Warehousing and Business Intelligence. So you want to see what’s new in SQL Server 2016 Reporting Services? Well I’ve got just the thing for you. My 12th course just went live on Pluralsight, named appropriately “What’s New in SQL Server 2016 Reporting Services”. This course is designed specifically for those who are already familiar with SQL Server Reporting Services, and just need to come up to speed with the new features in the 2016 release. Even better you can do it during a long lunch (or two short ones), the course is just under an hour and a half so you can learn quickly. The course starts with a look at the brand new Report Portal, the replacement for Report Manager. You’ll see how to create KPIs right in the portal, improvements to subscriptions, and how to custom brand the Report Portal so it can integrate right into your companies websites. After that you’ll learn about the new HTML 5 compatibility, something that makes SSRS integrate even better into your web apps and sites. Some time is then spent on improvements to what Microsoft calls “Paginated Reports”, essentially the same reports you’ve grown to know and love. You’ll see improvements for embedded reports, as well as the two new chart types, sunburst and treemap. Finally, the long awaited ability to arrange parameters is covered. Last, but certainly not least, the course covers what I consider to be the most exciting piece of the 2016 release, the Mobile Report Publisher. You’ll see how to use it to generate reports, and how they can be used on the web as well as mobile devices such as phones and tablets. What’s that you say? You want to see it, but don’t have a Pluralsight subscription? Hey, no problem. Just shoot me an email, free at arcanetc.com. I can send you a code good for 30 days during which you can watch this and any of the over 5,000 (yes, FIVE THOUSAND) courses. SQL Sever 2016 Reporting Services Cookbook has arrived! 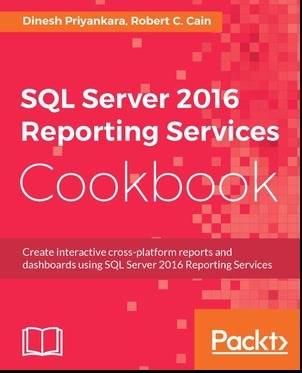 I’m proud to announce my latest book, the SQL Server 2016 Reporting Services Cookbook, has been released! This was a real labor of love, it consumed most of my summer and well into the fall. This book was published via Packt Press, and my coauthor was Dinesh Priyankara (blog | twitter). Chapter 1 – Getting it Ready – Configuring Reporting Services. That’s a lot of great material, over 500 pages of Reporting Services fun. Note as of this blog post Amazon has the Kindle version ready, the print version still shows as a preorder, but that will be out shortly. If you want the print version consider going to the publisher site as you can get both the print and e-book version for one low price. I want to thank my coauthor, Dinesh, who did a great job on his half of the book, as well as in designing the overall contents. Also a shout out to our editor, Amrita, who kept us in line and on track. I’ve not done much blogging, as I’ve been swamped with other activities. In addition I’ll be doing quite a bit of speaking, so let me catch you up. Recently I did a webinar for Pluralsight, “Why you should invest in PowerShell”. If you missed it the recording is now up, take a look, it’s free! Next, I just completed the first draft of my fifth book, SQL Server 2016 Reporting Services Cookbook. I’m coauthoring with another MVP and great guy, Dinesh Priyankara. The book is available from PACKT Publishing in Alpha form. I’ll make my debut appearance at IT/Dev Connections next week. I’ll be doing two sessions, the first is on October 11th, 2016: Zero to Hero with PowerShell and SQL Server. We’ll begin with a quick overview of PowerShell, then dive into using it with SQL Server. You’ll see examples of using it for both maintenance and development tasks. The next day is my second session is “So You Think MDX is Hard?”. This is for people who are new to MDX, and want to learn. You’ll see how to start from no knowledge all the way to building calculated members and sets. If you’ll be at IT/Dev Connections feel free to come by and say hi, would love to meet as many as possible. As if that’s not enough, on Saturday October 15th 2016 I will be at the DevSpaces Conference in Huntsville AL. At 4pm I’ll be presenting “High Class PowerShell: Objects and Classes in PowerShell”. You’ll see how to create your own classes using PowerShell. We’ll cover techniques valid in PowerShell versions 3 and 4, as well as see how the new class types in PowerShell version 5 work. As they say on TV, but wait! There’s more! On November 1st 2016 I will be coming to Atlanta to the Atlanta SQL Server BI user group. My presentation “Shiny and New: SQL Server 2016 Reporting Services” should be a lot of fun, and introduce you to the new features in SQL Server 2016. Whew! There’s two more Atlanta based events in Nov/Dec it looks like I’ll be at, once those are finalized I’ll let everyone know. I’ve also established a GitHub repository for my various samples. You’ll find it at https://github.com/arcanecode. As I move forward I’ll keep this repository updated.